Trading is one of the most fun aspects of Magic finance, but it can also be a huge pain. Between dealing with unreasonable people, trade sharks, and a constantly shifting market, actually completing a trade can be quite an undertaking. But when we do make a good series of trades, it makes it all worth it, right? 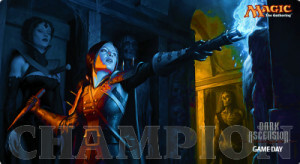 Flipping five or six uncommons you opened at the prerelease for a mid-tier rare that you trade for a spec target that doubles up and gets you a Thoughtseize or a fetch land is exactly the kind of story that makes people want to get involved in Magic finance. It makes a lot of sense that the MTG finance boom came right after Jonathan Medina’s Pack to Power series: everyone wants to be able to flip bad cards for the best cards, and Medina demonstrated to what extent it could be done. Trading isn’t nearly as prevalent or popular as it once was, of course. I hardly ever find anyone at my LGS with a binder these days, and when I do, it’s virtually impossible to get any sort of fair deal. In recent experiences, I’m finding that people are either intent on sharking or so afraid of being sharked that they’re too timid to make big trades. With this in mind, maybe it’s time to take a moment to go over some basic concepts involved in trading. For the casual traders, it will help you feel confident that you’re getting a fair deal. For the financier types, maybe it will help you realize that you don’t need to be getting twice the value as your partner in every trade. Making more trades with smaller value gains is generally more profitable than trying to rip off every person with whom you trade. It’s ten minutes before FNM starts, and you overhear an acquaintance trying to pick up his last Siege Rhino before the event. You’re tuned into MTG finance and know that Travis Allen has been touting this as a good pick-up for some time, and you happen to have a few copies in your binder. You don’t necessarily want to trade any away, but when the guy comes and asks you if you have one available, you figure it can’t hurt to take a look at what he’s offering. You have the power in this situation. Your trade partner “needs” this card, and you don’t feel a particular drive to trade it away, so a “fair” trade is not to be expected here. Many players completely fail to grasp this concept. In their minds, the only thing that matters is what the TCGplayer mid says, and if you ask for more than that, then they assume that means you’re trying to rip them off. As a result, these players enter a lot of tournaments with sub-par decks lacking many of the cards they need. Asking for additional value to encourage you to give up a card you don’t feel particularly driven to unload is not trade sharking, unless you’re lying to your trading partner about what the cards in question are worth. If you start asking for unreasonable amounts of value, you might be approaching shark territory, but as long as your trading partner knows what’s going on, he or she can always just walk away. Then you’re not a shark—you’re just a bad trader who failed to close a deal. It’s when you misrepresent information that things get shady. This power dynamic shifts a bit if you have cards you’re actively looking to trade away. I’m going to invoke Travis Allen again here, because he touched on this exact topic in his article earlier this week. Basically, you shouldn’t be afraid to take a small loss on soon-to-rotate cards today if it means dodging a major loss on them tomorrow. I’ll give you a recent example. This past Friday, someone flipping through my binder expressed a passing interest in my Courser of Kruphixes and Sylvan Caryatids I hadn’t managed to get rid of just yet. My eyes lit up when he asked about them. He wasn’t exactly sure he wanted them, and was waffling a bit. Eager to make the trade, I gave him a few dollars in value on a $35 trade, and I made sure to let him know that I was doing that for him. Travis went on to point out that if he didn’t make that trade, there’s a good chance he wouldn’t have been able to trade off the cards until they were worth only $20, losing money in the long run. So in that case, the other guy didn’t need the cards, he had a vague interest in them. That’s not the time to ask for extra value. If you think the card is going to go up or have a particular attachment to it, just don’t trade it. If you’re actively looking to get rid of it in the face of greater losses, give up value if you have to, within reason. Do you want to make the trade or not? It’s June 1999, which would have made me 14 years old, I guess (yes, I’m an Old™). I have just opened what might be, in my young eyes, the sweetest card in Urza’s Legacy: Palinchron (aside to my aside: holy crap, I didn’t realize this had been ascending from $5 where I picked a copy a few years ago. Paying attention is important). I don’t remember exactly what I was doing at the LGS that day. I was probably playing a match, and an adult guy I did not know asked to look at my binder. I let him, he asked if the Palinchron was for trade, I told him probably not but maybe, and he asked if he could take it out of my binder. Because I was a dumb kid, I said yes. It wasn’t until later that night that I realized I’d never negotiated with him, and what do you know? The card wasn’t in my binder anymore, either. I never saw the guy again. Don’t trade while you’re playing a match. Don’t ask to trade with someone who’s playing a match. Don’t let people steal from you, especially in such obvious and avoidable ways. “Trading up” refers to trading several cards of lower value into one or more cards of higher value. “Trading down” refers to the opposite: trading a high-value card for lots of cards of lower value. Another concept players often fail to grasp is the idea that expensive, often out-of-print individual cards are harder to obtain and thus more desirable than an “equal value” amount of many lower-value cards. Cards that are just above bulk, in the $0.50 to $1 range at TCGplayer mid, cannot just add up to Standard staples using the same valuation method. 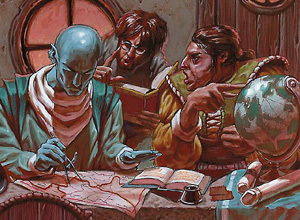 You may find finance-minded mages willing to trade down real cards for bulk rares, but they’re valuing them at 10 to 25 cents each depending what the card in question is. Even something like trading actual Standard staples like Thunderbreak Regent or Elspeth, Sun’s Champion into out-of-print Modern or Legacy staples like Vendilion Clique, Tarmogoyf, and dual lands is probably going to require some sweetening by the person trading up. If you’re dealing only in trade, it’s a lot easier to pick up a pile of Abzan cards than it is to find someone in possession of and willing to trade a Volcanic Island. Unless the person trading down is motivated for one reason or another (I’ve heard of shop owners all too excited to trade dual lands for Standard staples that people at their LGS will actually buy, for example), the person trading up should just understand they need to give up value. 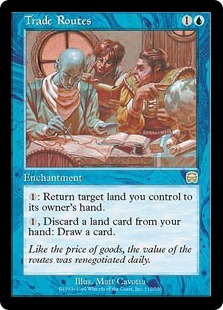 I recall a several-year-old Corbin Hosler article discussing trading a dual land down to a player for Standard cards (Huntmasters were involved, I’m sure of it) and Corbin explaining to the other guy that he was going to value his cards at buylist prices. The guy did not take it well, which is an example of why trading is so hard these days. Corbin was ultimately doing the guy a favor and he was not concealing information for gain, but the guy still thought it was unfair. This is why it’s so important to understand when you’re trading down or trading up. Basically by a fluke occurrence caused by the most casual of these events I have ever seen, I managed to win a Dark Ascension Game Day, including the playmat, with a non-optimized version of Illusions despite Delver being a well-established deck by that point. I just showed up because it was free to play and everybody who showed up got a Strangleroot Geist promo, which I thought was super sweet. I had noticed that playmats generally sell for $10 to $20, so I thought I was really getting a good bargain here. Stupidly, I had failed to look on eBay and notice that these were going from $50 to $100 at the time. I traded it away for two Gravecrawlers and other junk I didn’t really want or need, basically because the guy wouldn’t leave me alone about it. Don’t let yourself be bullied into a trade. Don’t trade something without knowing its value. You might regret it. The best and easiest trades are when you have cards your trading partner needs, she has cards that you need, and those cards’ values are close enough that trades can go straight across with maybe some random throw-ins on one side or another. Of course, Magic financiers don’t often have needs, per se. There have been times where I was trading with no particular goals but to make value. In these situations, you’re looking to have cards that people will need, so that you can have power in trades to get a little extra value. If you’ve got a bunch of stuff that nobody wants, you’re not going to accomplish your goals. What about trading with financiers? Is it just not worth the time? In my experience, it often isn’t, but if you feel like doing it, it really becomes a game of who is speculating on what. You’re not going to get much current value out of your trading partner, so you need to figure out what he is bullish on that you’re bearish on, and vice versa. This is a way that two financiers can walk out of a trade and both feel happy. Finally, I recall back in my Standard days that Silverblade Paladin was going for $9 or $10 at Star City Games but had a TCGplayer mid of $12. If you know anything about SCG prices, you know that it’s very rare for SCG to have a price below TCGplayer mid. I used this knowledge to trade for Paladins with people who used SCG prices and to trade away Paladins to people using TCGplayer prices. Noting value differences like this can often make you money. As a general rule of thumb, it favors you to trade up using SCG prices if possible, and to trade down using TCGplayer prices if possible. 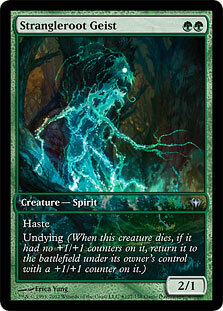 SCG prices on high-value cards are closer to market price than bulk rares, which all get marked up to at least $0.50. One time, I was looking through a guy’s binder and a page had a crushed cockroach on it. That’s extremely gross, but I just chose to not mention it and quickly turned the page. Then I got to the center of the binder, where the folios fold and there’s a little space in the spine. The entire spine of the binder was filled with cockroaches. An onlooker remarked in horror about it, I sat there shocked and appalled, and my trading partner profusely apologized and said he had been dealing with a huge infestation at home. I did not complete a trade in that instance. Don’t live your life in such a way that this ever happens. That’s all I’ve got for this week, kids. Until next time! I love the way you drew lessons out of every experience you had. I had never read that Jonathan Medina series as it was during my 11 year stint away from the game. Really awesome stuff. Doubt it’s possible to do something like that in 2015 but who knows. Story #3 actually happened to me once when I was looking through a Yu-Gi-Oh player’s binder at an event. It really is quite the horror.